Excellence Two – Mini Monitor Construction Update4! I have made frequency measurements for the “Excellence Two – Mini Monitor” this weekend and the measurements look good. Both the mid-woofers and the tweeters measures as expected and each sample are a close match to each other and the build consistency seems to be very good. The mid-woofer has cone break-ups at 10kHz and 13.5kHz. These break-ups are visible in the distortion measurements and have to be eliminated in the cross-over design with a notch filter centered at the stronger 10kHz break-up. They have a very smooth mid-range frequency response up to 2kHz where it starts to roll-off and does so without any visible cone-edge resonances. A 3-4dB BSC (Baffle Step Compensation) seems to be a good starting point to test with these mid-woofers. The tweeter has a nice smooth frequency response with a slightly rising top-end response at the on-axis measurement. The baffle diffraction is noticeable at 3.5kHz as a mild dip in the frequency response. This dip flattens out as the off-axis angle increase and is gone at a 30 degree angle. Read full article |Comments Off on Excellence Two – Mini Monitor Construction Update4! Revelation Two – Monitor Distortion Measurements! 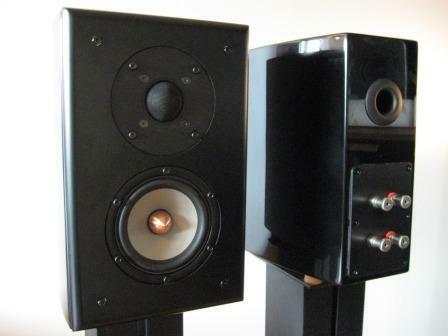 I have updated the Revelation Two – Monitor design with distortion measurements of the finished loudspeaker. I have also updated the driver unit measurements section with distortion measurements for the ScanSpeak mid-woofer 15W/4531G00 and the tweeter D2608/913000. Read full article |Comments Off on Revelation Two – Monitor Distortion Measurements! Excellence Two – Mini Monitor Construction Update3! I’ve done distortion measurements on the driver units used in the design. The measurements are consistent with my research and listening tests of the loudspeaker driver units. Both drivers perform very well and especially the tweeter impresses me a lot. Considering the listening and measurement performance, the tweeter is a real bargain. The tweeter is very low distorting and it appears to have “copper” in all the right places in the motor design. With a proper filter design, this is one of the few tweeters that actually could work together with an 8” woofer in a 2-way. It can be crossed-over as low as 1.2kHz, if used properly. The mid-woofer has the expected cone break-ups at 10kHz and 13.5kHz. These break-ups show up in the 3rd harmonics at 3.3kHz and 4.5kHz and at the 5th harmonics at 2kHz and 2.7kHz. The active cross-over I’ve been using while breaking in the drivers is crossed-over at 1750Hz. My listening tests confirms that it’s a rational cross-over point. Together with a properly constructed notch filter, I wouldn’t use this driver higher than 2kHz in order to deal with cone break-ups properly. Somewhere between 1.7-2kHz seems doable. Read full article |Comments Off on Excellence Two – Mini Monitor Construction Update3! Excellence Two – Mini Monitor Construction Update2! I have measured the loudspeaker with my DEQX pre-amp equipment and made various cross-over configurations in order to get a sense of how the drivers behave and integrates with each other. A low cross-over point is clearly the way to go with these drivers. Right now I favor the 1750Hz cross-over point, but this might probably change after I’ve done frequency and distortion measurements and starting to simulate the passive cross-over. 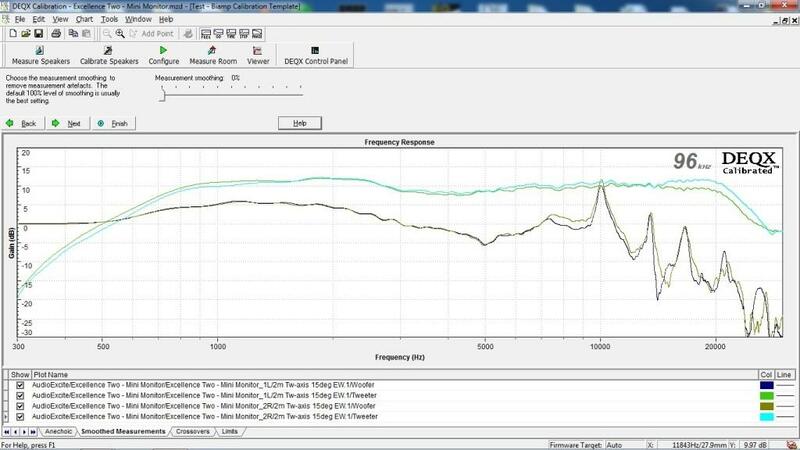 The picture shows the 2m tweeter-axis 15deg measurement I’ve used for the quick DEQX cross-over. The measurement is valid from 400Hz. Notice the very mild effect of the baffle diffraction at the 15deg off-axis measurement. The mid-woofers have a nice even frequency response and the expected 10kHz cone break-up is clearly visible. The two mid-woofers are a close match of each other. The tweeters have a nice even frequency response and the sample 2 has a slightly higher sensitivity and a rising top-end response compared to sample 1. In the cross-over region they are a close match and the overall difference is small and isn’t noticeable in listening tests. Read full article |Comments Off on Excellence Two – Mini Monitor Construction Update2! Excellence Two – Mini Monitor Construction Update1! Since I’m using the Parts Express 8liter (0.25ft3) curved enclosure Dayton 8 liters Curved Cabinet #302-701 for this design and it’s a bit oversized for the used mid-woofer, I need to reduce the internal volume by approximately 2 liters. 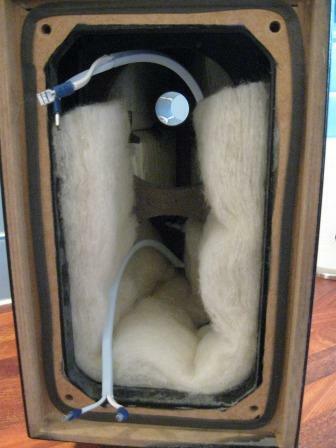 I used very dense foam pads which I glued to the upper rear side-walls to reduce the volume. 4mm bitumen pads are glued to the side-walls in the front part of the enclosure to reduce vibrations and to reduce the internal volume as well. 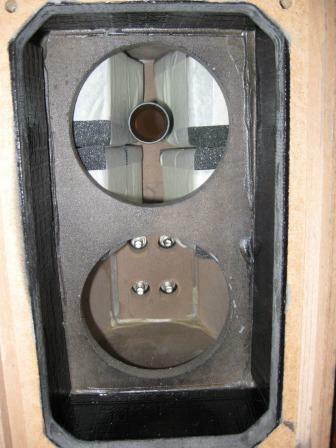 I’ve used a 29mm (1 1/8”) bass-reflex port tuned to 45Hz (see pictures). 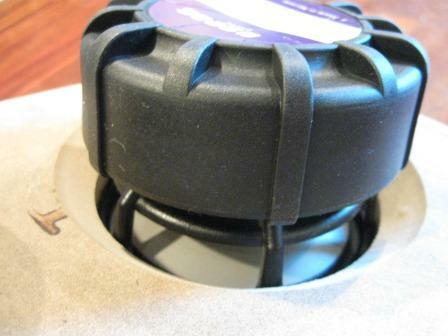 Even though the W12 mid-woofer is well ventilated it’s very important to chamfer the baffle in order to let the mid-woofer breathe properly. This is also partly the reason why I choose a relatively wide baffle (19cm or 7.5”) for such a small driver unit. I have used less wide enclosures for similar sized driver units before and my conclusion is that many times you get reflections from the side-walls that affect the midrange performance, if the driver isn’t allowed to breathe unrestricted. This is not always clearly visible in measurements, but is clearly noticeable in listening tests. I use SUPRA both for signal and loudspeaker cabling in all my designs and HiFi equipment and I think these cables have a great price/performance value. Read full article |Comments Off on Excellence Two – Mini Monitor Construction Update1! Excellence Two – Mini Monitor Construction! I have begun the construction on the “Excellence Two – Mini Monitor” and there are new driver unit measurements added to the measurements section. For this design I will use the Dayton 0.25ft3 (8 liter) curved cabinet. This cabinet is a bit oversized for the design and I will have to reduce the internal volume to make it work well. If anyone chose to build their own cabinets this is not necessary, but the baffle layout and size must be the same as the design. I will soon be back with some build pictures. Read full article |Comments Off on Excellence Two – Mini Monitor Construction! The website launched successfully this weekend and I had a lot of visitors. I´m still fine tuning the website layout and I have changed the menu configuration slightly so it’s a bit easier to find e.g. the measurements section etc. I will begin to fill up the site with more technical content as soon as I feel comfortable with the website layout. Read full article |Comments Off on Website Layout Changes! Revelaton Two – Monitor Released! The Revelation Two – Monitor is now released! You can find it in the “loudspeakers” section. Read full article |Comments Off on Revelaton Two – Monitor Released! Welcome to AudioExcite Loudspeaker Design! The AudioExcite website for loudspeaker DIY:ers are now launched. The site is still under construction, but will expand and fill up with new material over time. Be sure to check the “News!” sidebar, when new loudspeaker designs or other information are available. Read full article |Comments Off on AudioExcite website launched!